Winter is still in full swing here! 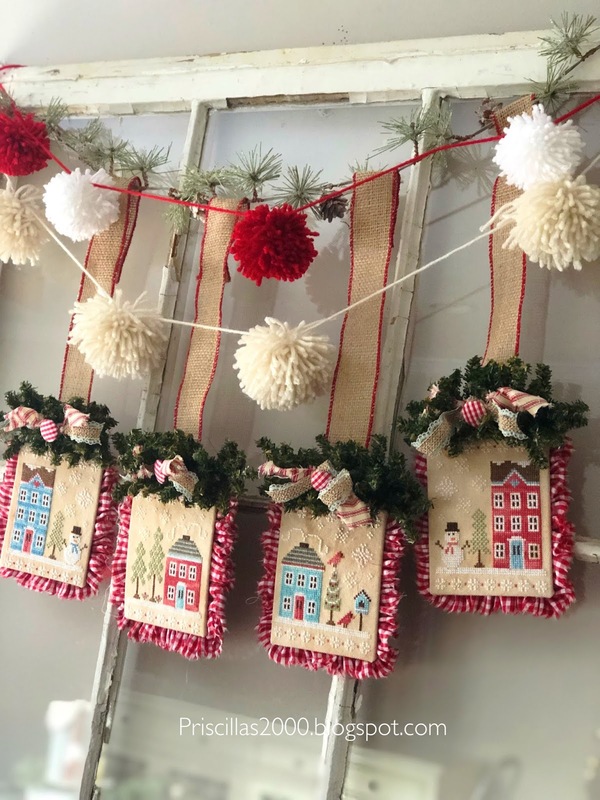 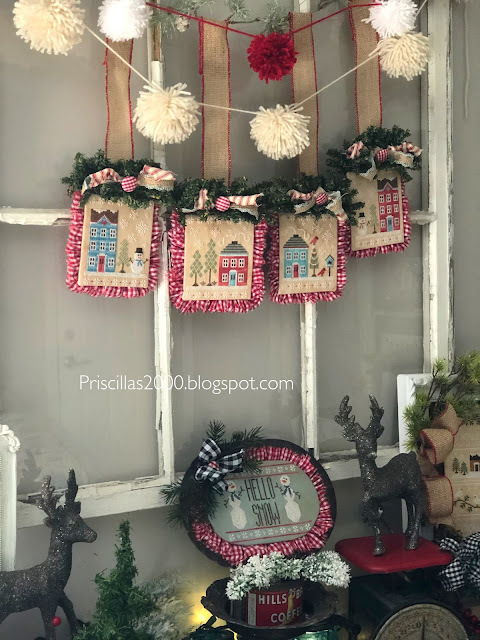 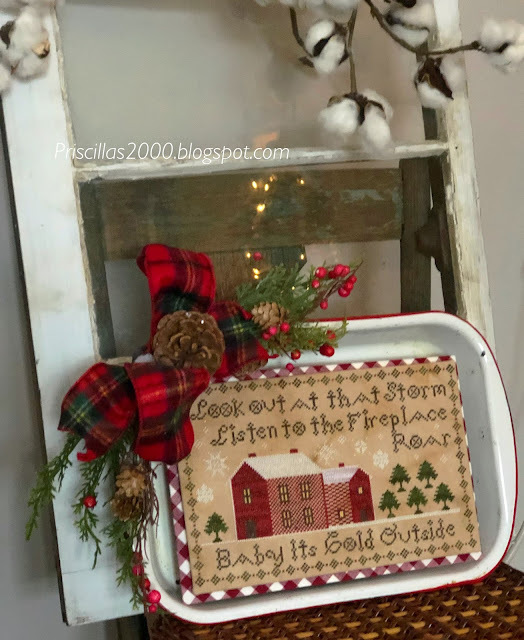 We have about a foot of snow on the ground and it is -7 right now ... BRRRR..
2 strands of pom poms hang from the top of the window and then the snowy stitched banner .. 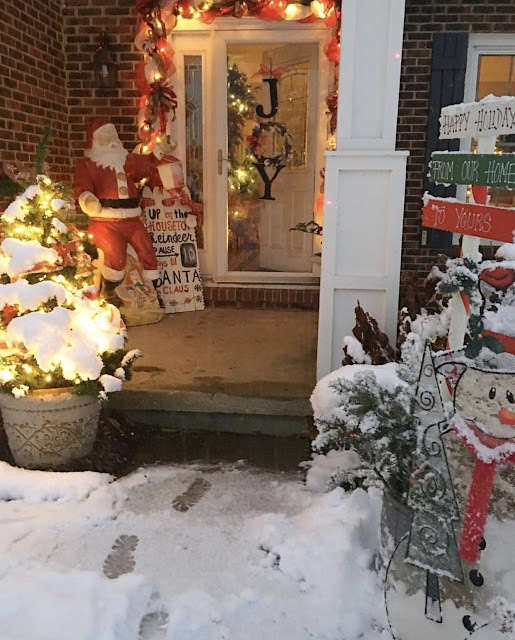 It is a snowy one here! 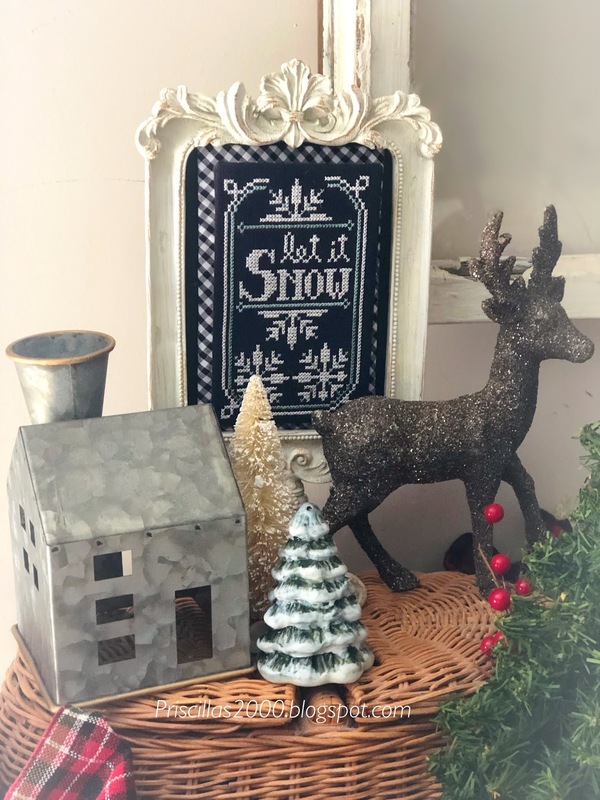 I found this vintage mini cheese grater at the Goodwill a couple weeks ago and when I got this cute little Ready Set Snow chart from Hands on Design I knew I wanted to use it on the grater ..
We are supposed to have about 7 new inches on top of the 7 we got the other day so lots of snow! 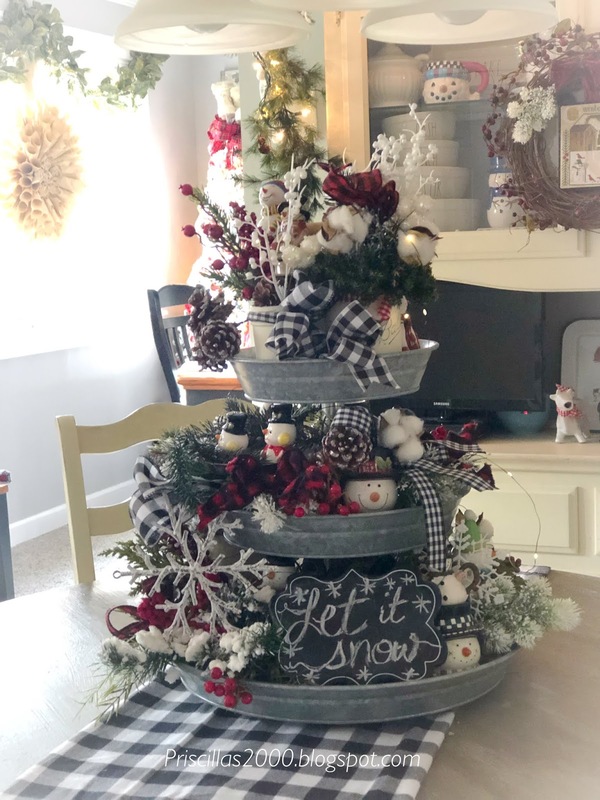 It is so pretty! Have a great day ! I am off to stitch some Farmhouse Chalk... LIKE IT'S MY JOB :) Haha! I decided I didn't want just a wreath on the front door ...so off to Hobby Lobby I went ! I bought 3 wood letters ( unfinished ) and a small grapevine wreath .. 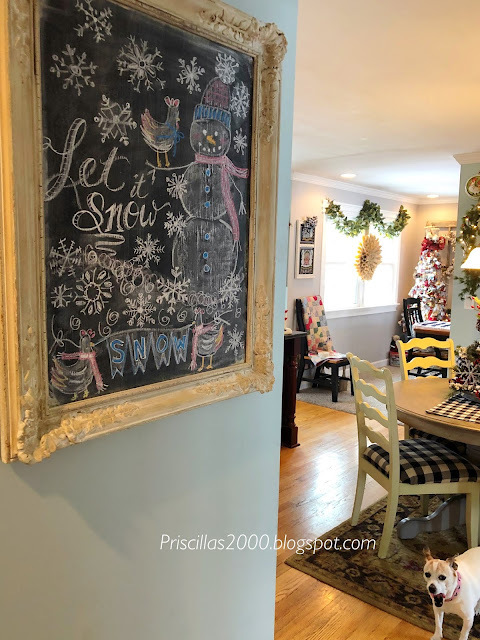 I brought the letters home and painted them with chalkboard paint .. 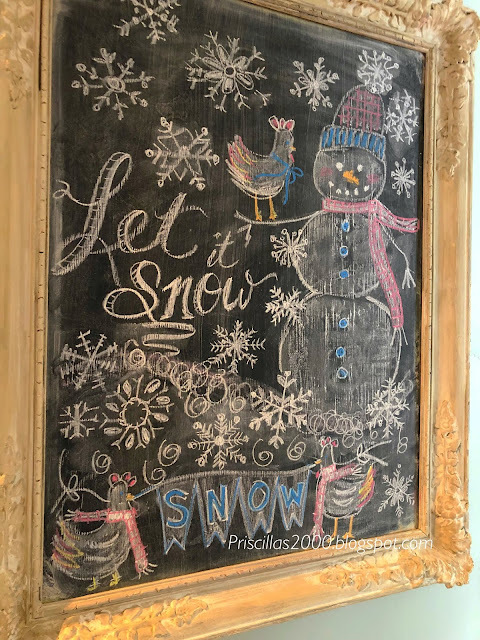 I then used chalk to outline them ..
because here in Illinois winter is just getting started ..so we went from JOY on the front door to SNOW! 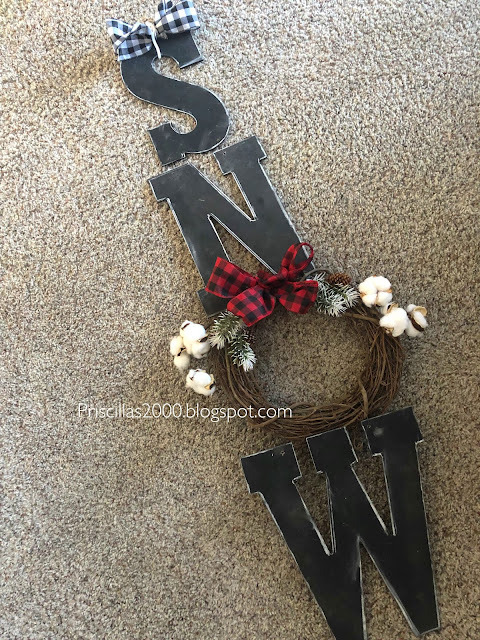 Chelsea drilled holes in the letters and I used thin wire to attach them all together .. 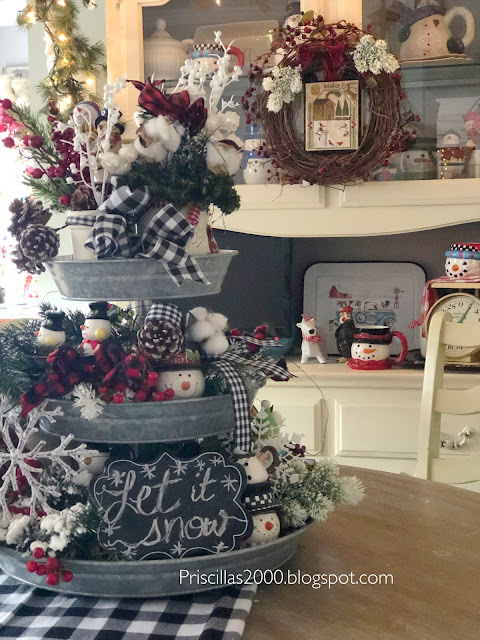 I added some cotton branches and buffalo check ribbons to the wreath along with some flocked greenery picks .. 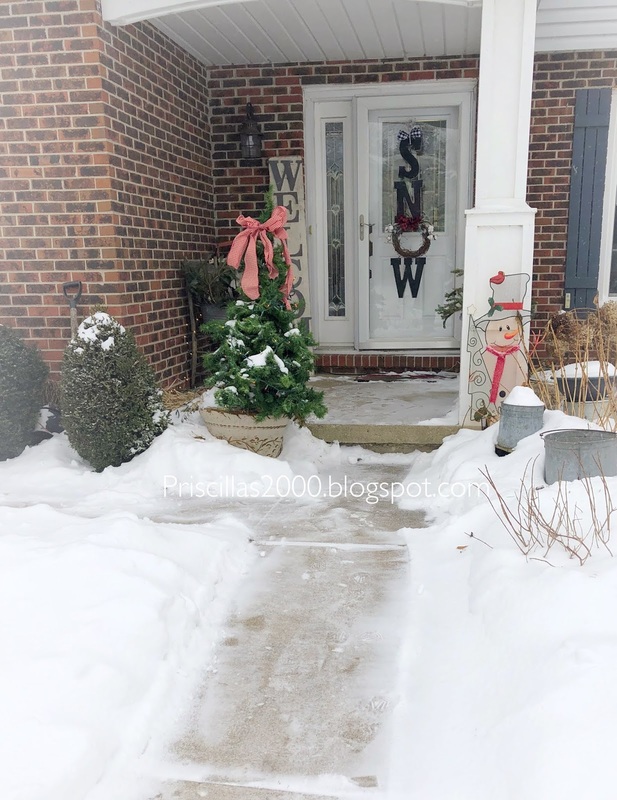 It's another snowy day here .. only supposed to get about 4 inches .. but hey it is good for all the plants and grass! 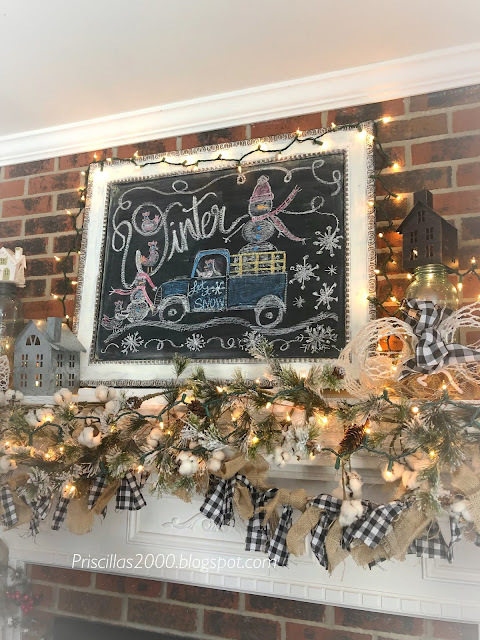 The mantel is all winterized! 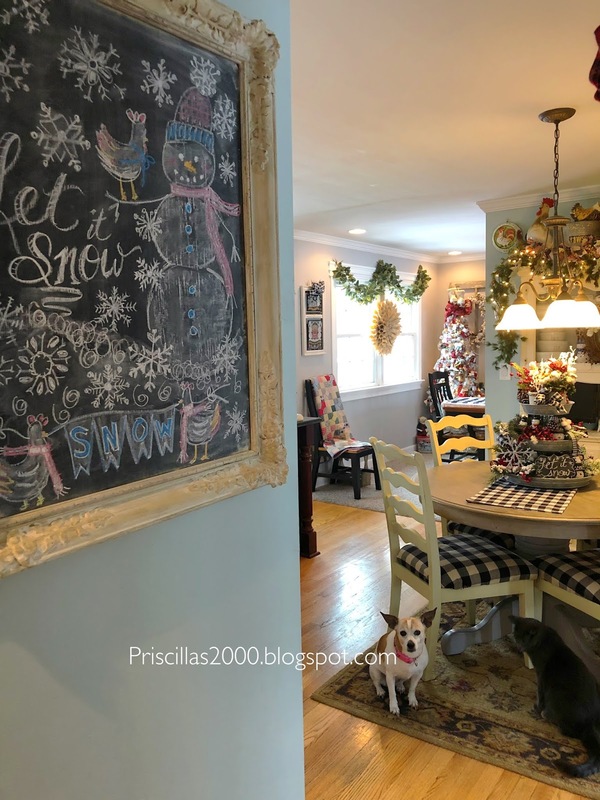 The metal house lanterns came from Walmart in the fall ,, there are huge vintage blue mason jars holding up houses ..There are lots of little white lights .. some are the twinkling kind .. so pretty for these dreary days of Winter ! 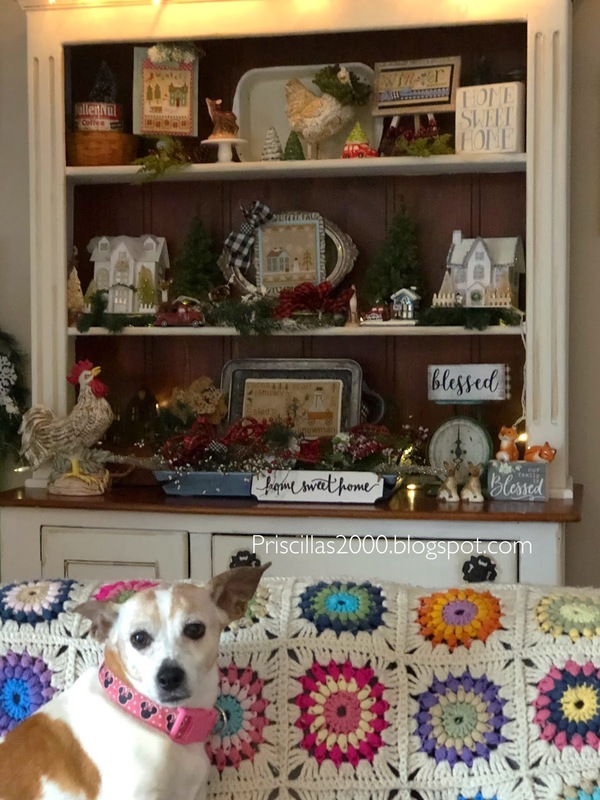 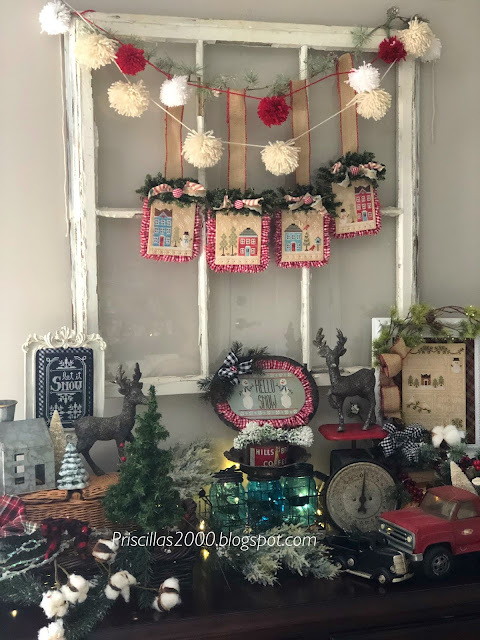 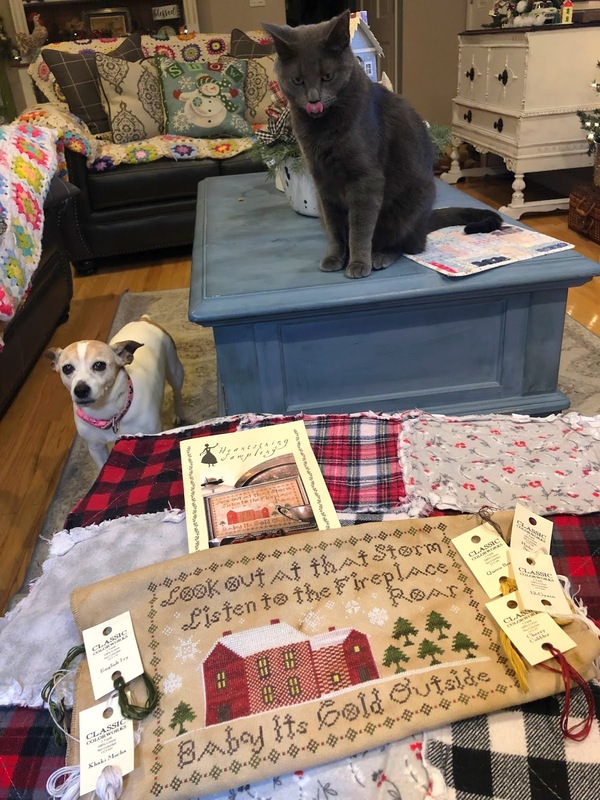 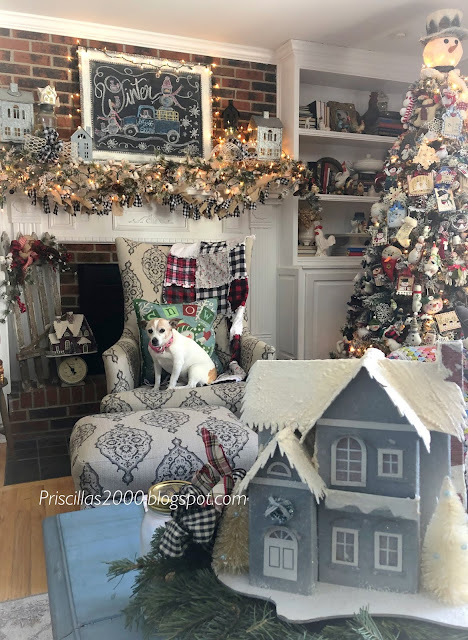 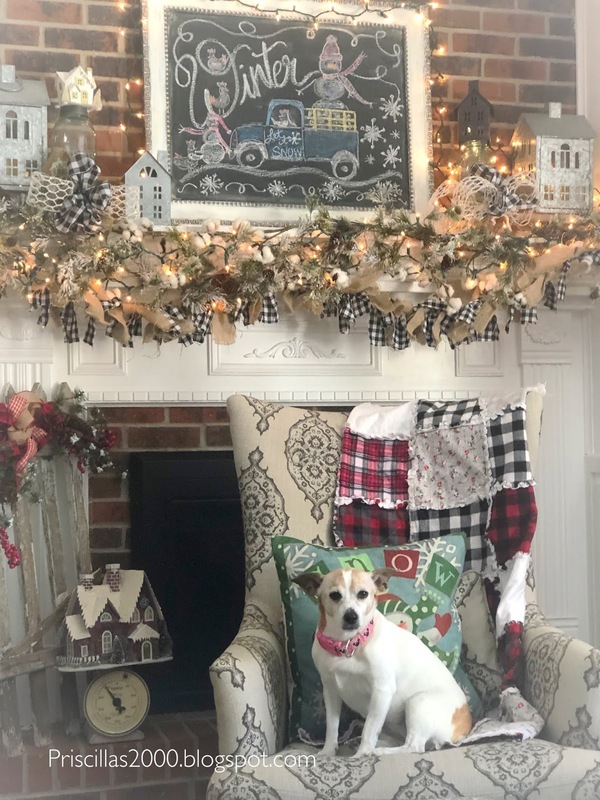 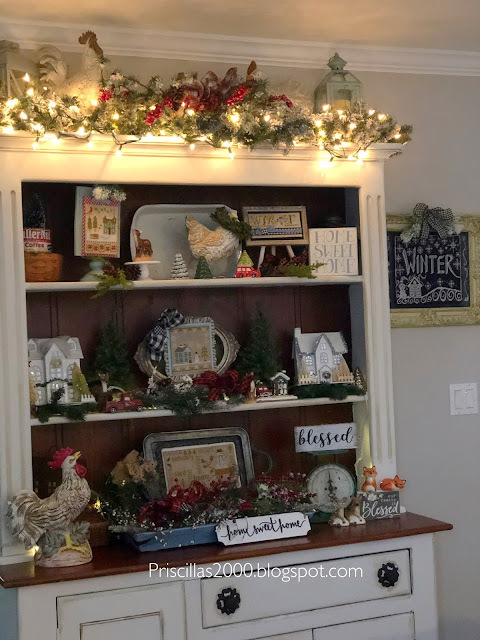 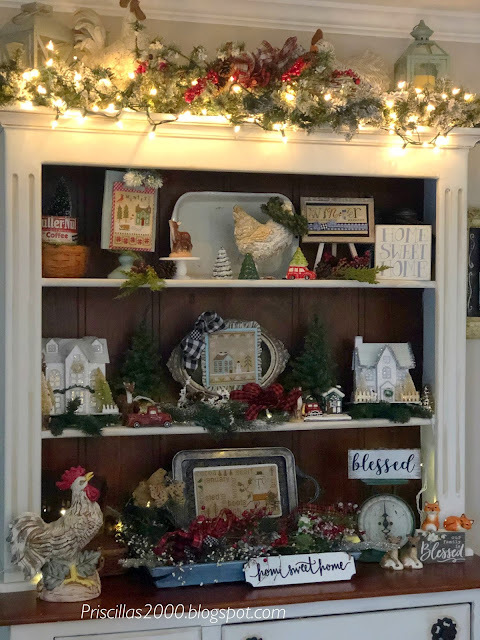 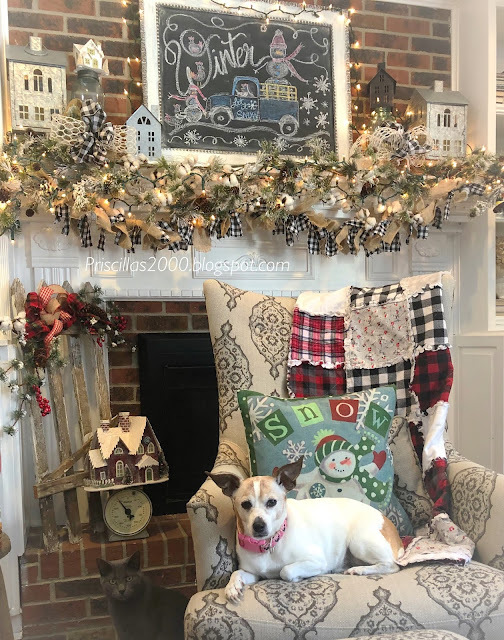 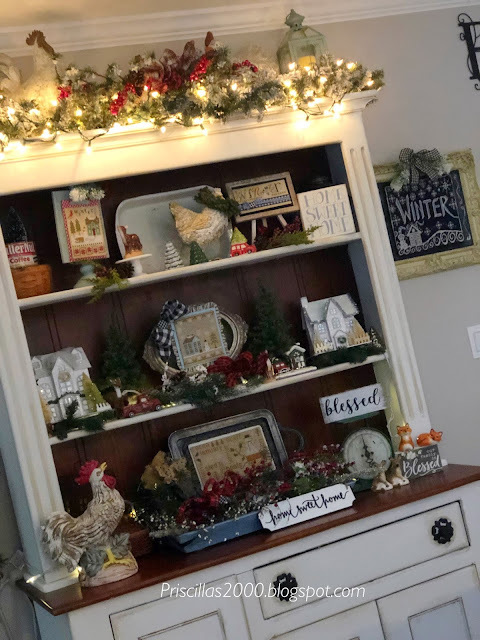 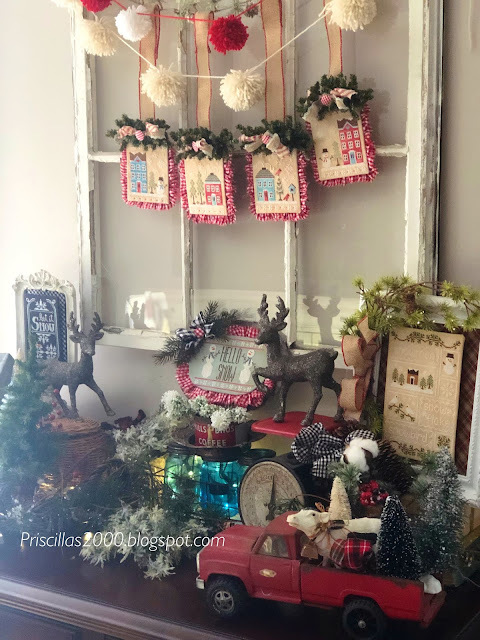 Bows of black buffalo check and white chicken wire ribbon are at each end of the mantel ..
there is a piece of vintage fence on the hearth ... and a vintage scale with a glitter house on top .. 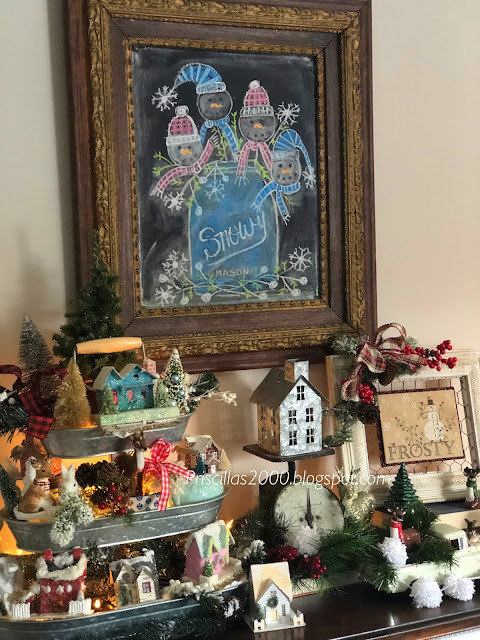 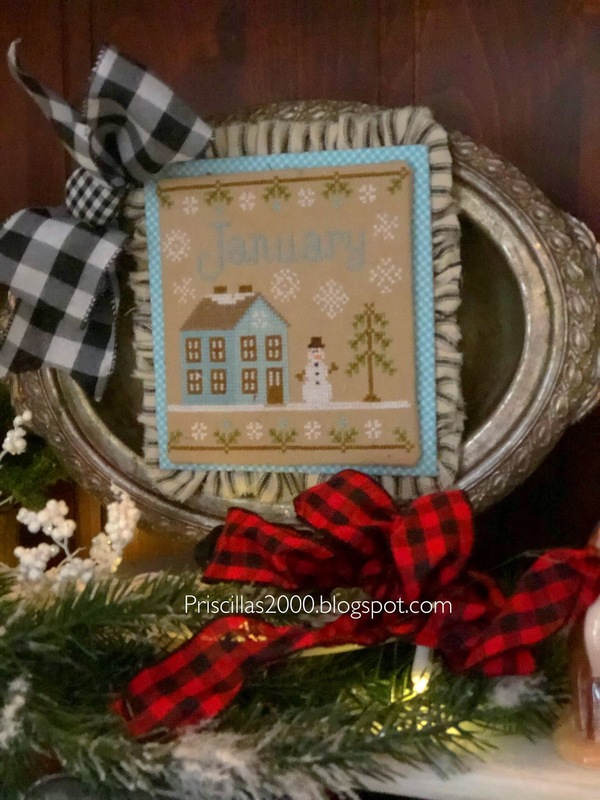 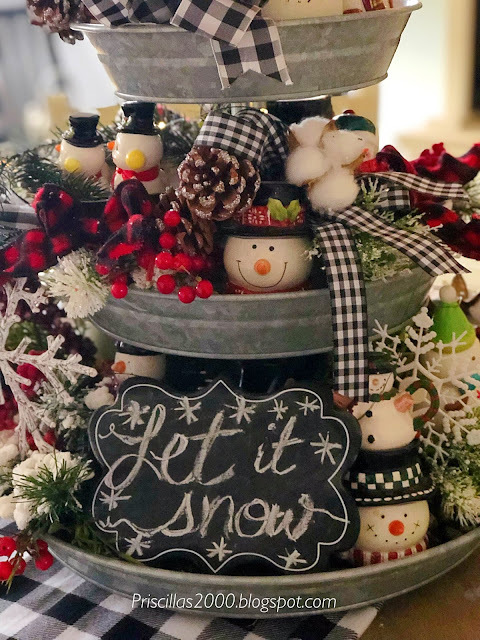 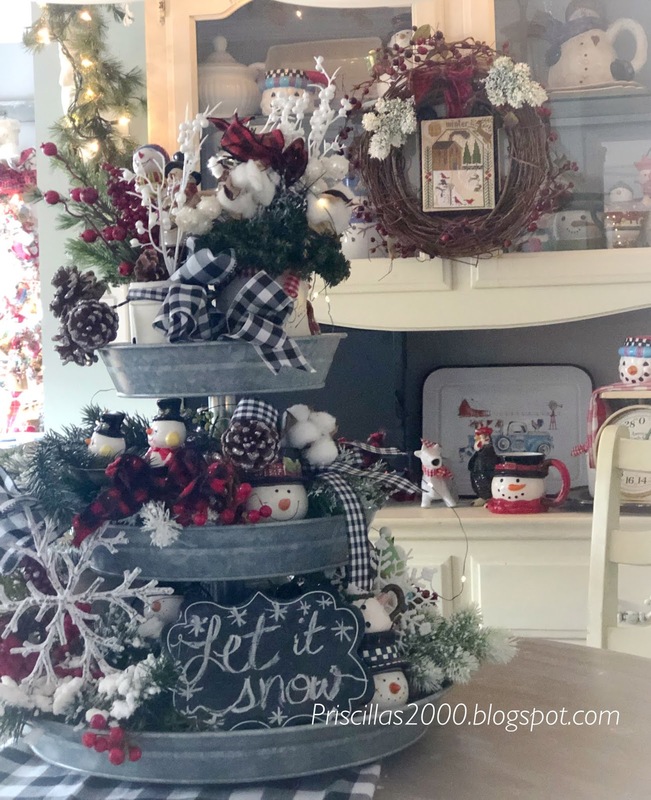 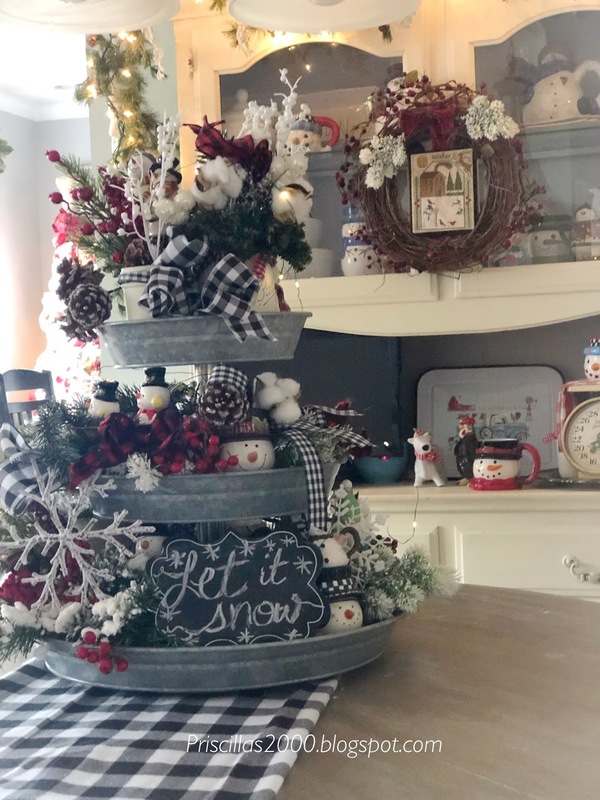 I keep the snowman tree up into February , since it is totally decorated with snowmen ..The coffee table has a vintage white enamel bowl filled with greenery and a glitter house on top ..
We are expecting a bunch of snow tonight and really colder temps so this piece is perfect! 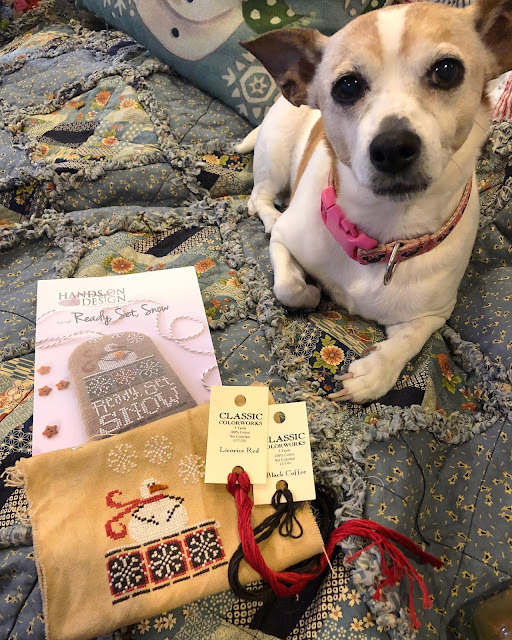 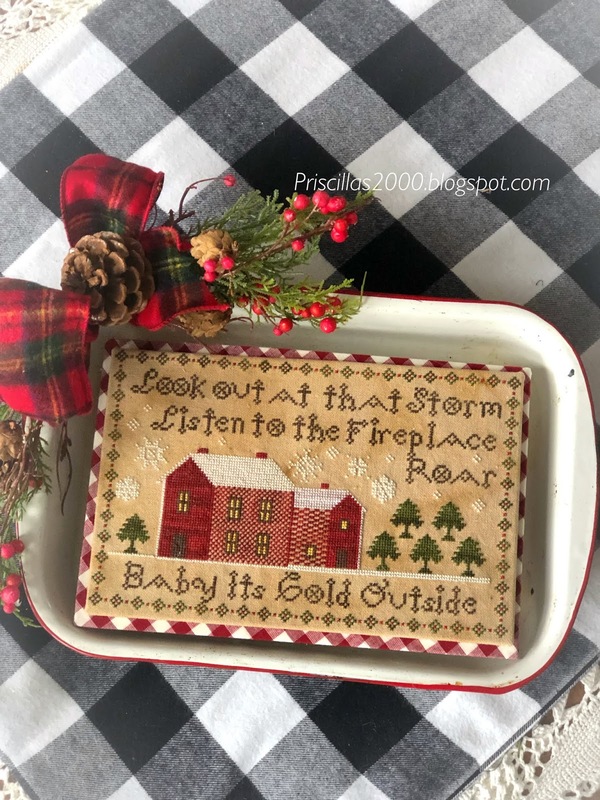 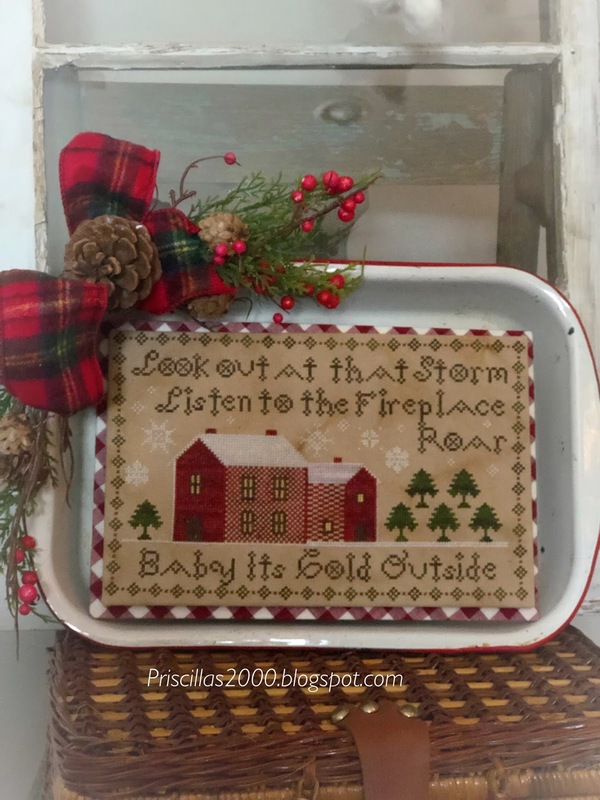 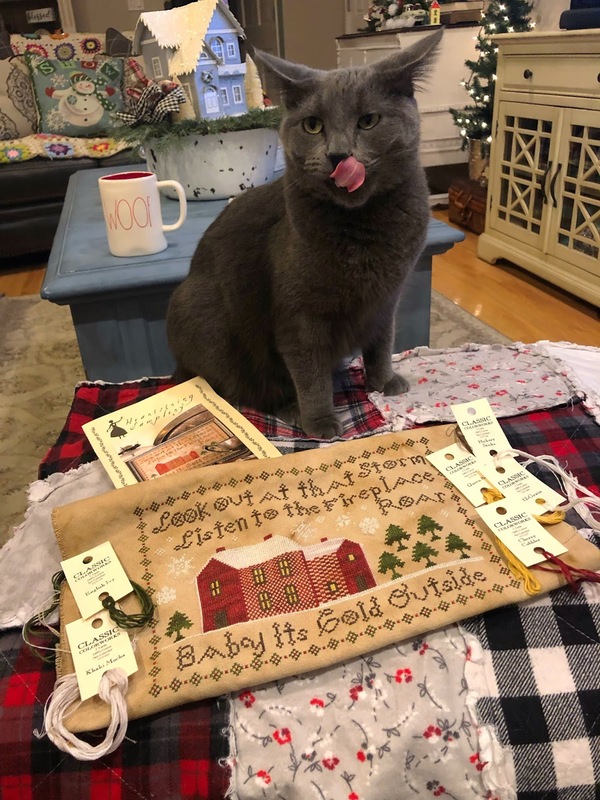 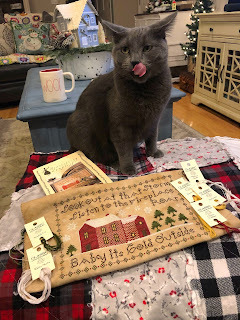 This is Baby Its cold outside from Heartstring Samplery ... 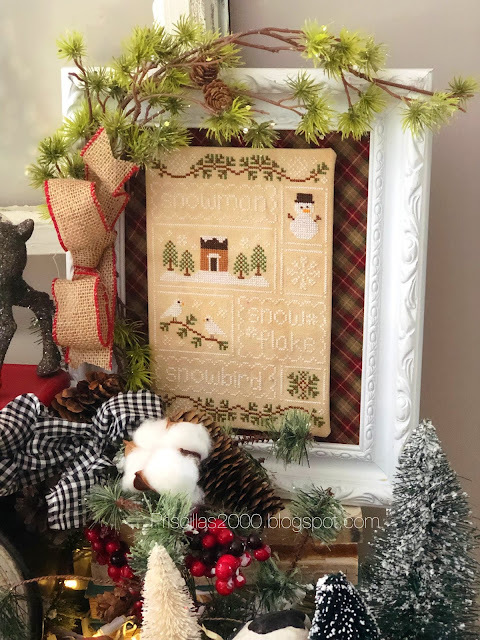 This is the first chart I have stitched from this designer and it went so fast! 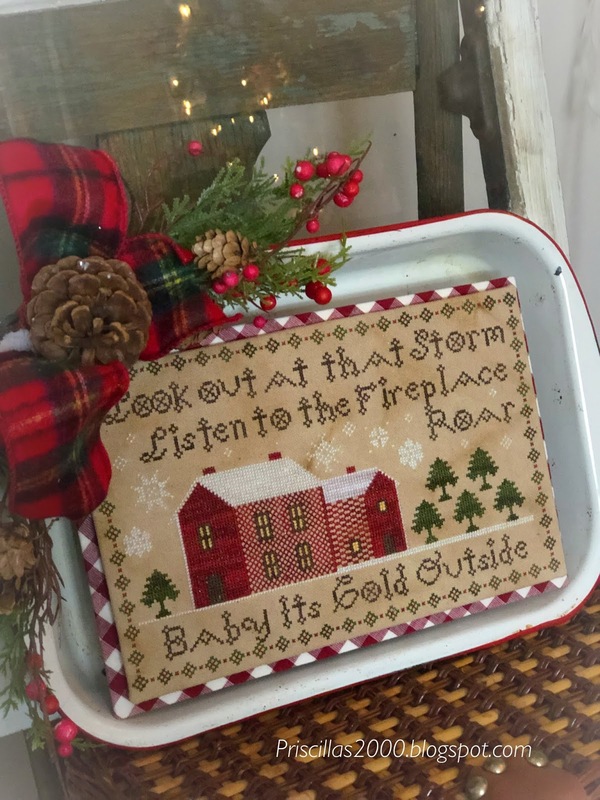 I have it displayed in the family room on a vintage chair with a vintage window behind it ..on top of a thrifted picnic basket .. 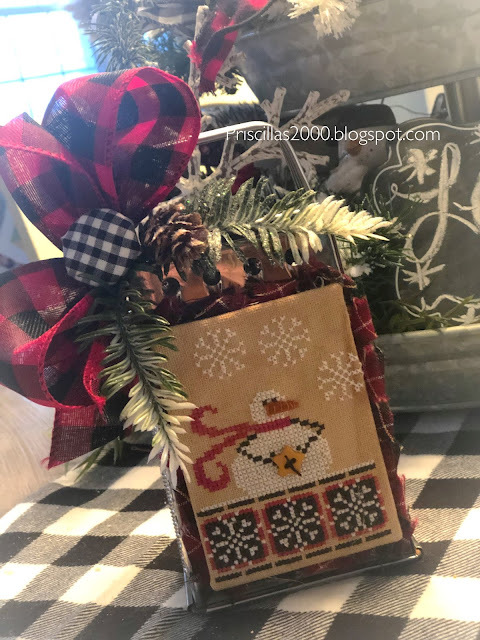 It is mounted on sticky board and then attached to a piece of sticky board I wrapped with red check homespun .. I mounted it in a vintage enamel tray .. 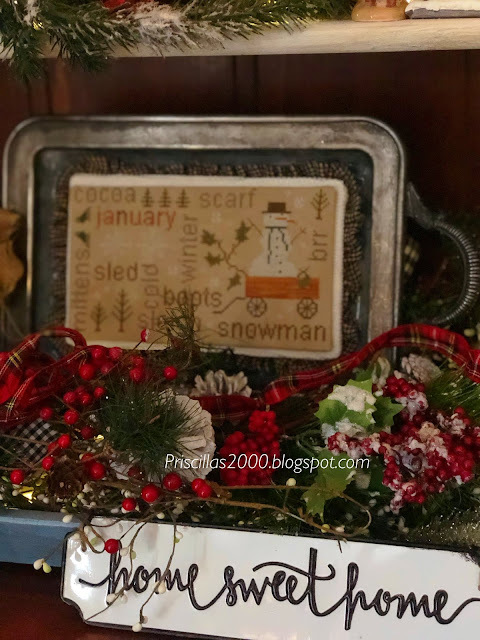 I used a small block of wood and magnets to attach to the tray because this tray usually sits on the top shelf of the hutch in the family room and I want to keep it pristine in its rusty chippy appearance :) Its raised up in the bottom of the tray mostly because of size and the use of the wood block ..
Classic Colorworks floss.. English Ivy, Cherry Cobbler, Queen Bee, Hickory Sticks , 12 Grain and Khaki Mocha .. Stitched on 28 count (tea coffee dyed 3 times to get it dark enough) Monaco.. 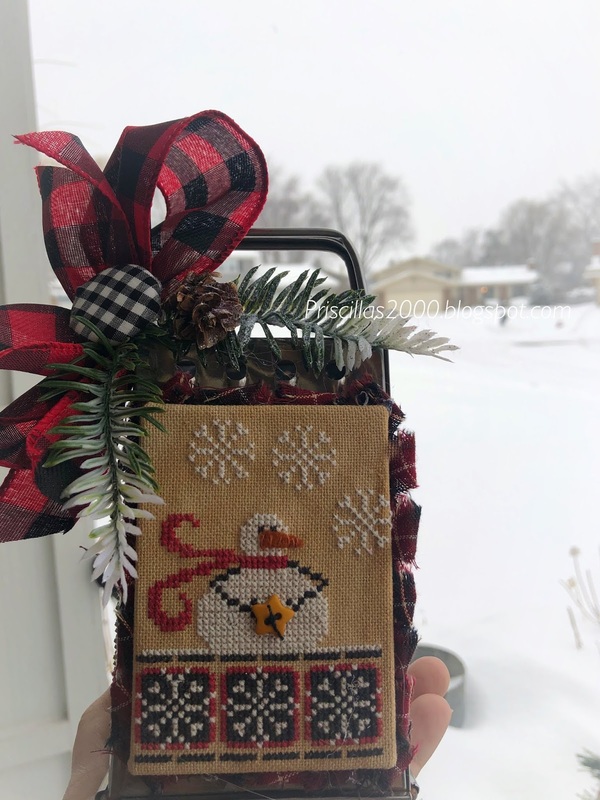 I started it on Monday and finished on Thursday .. it was a quick one! 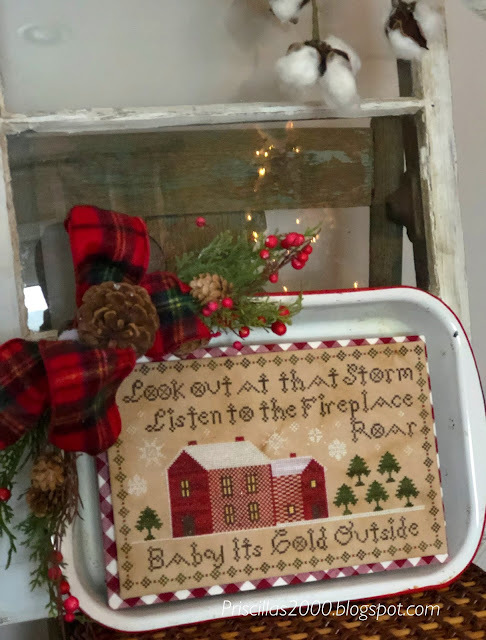 Love it so much .. it will stay out through the rest of winter ! 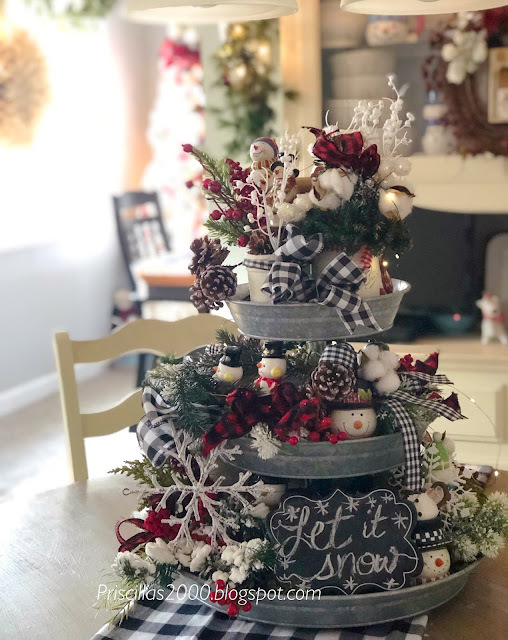 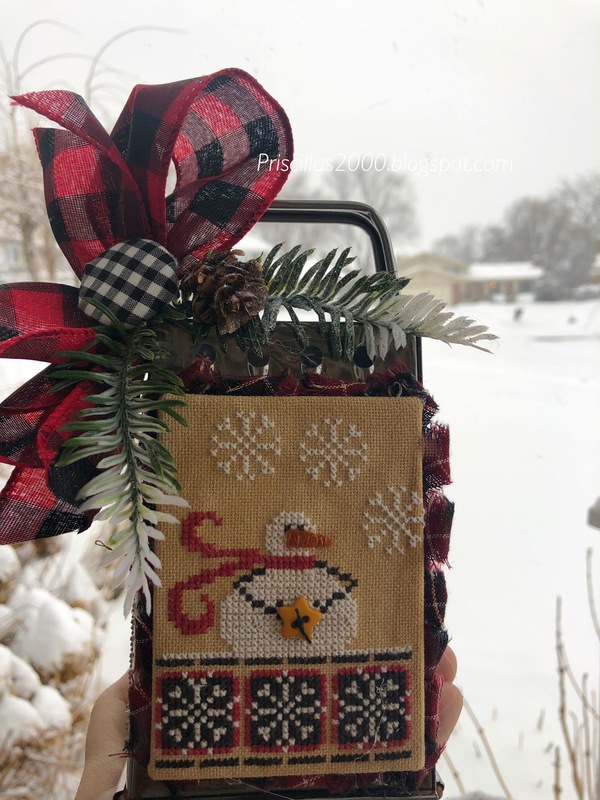 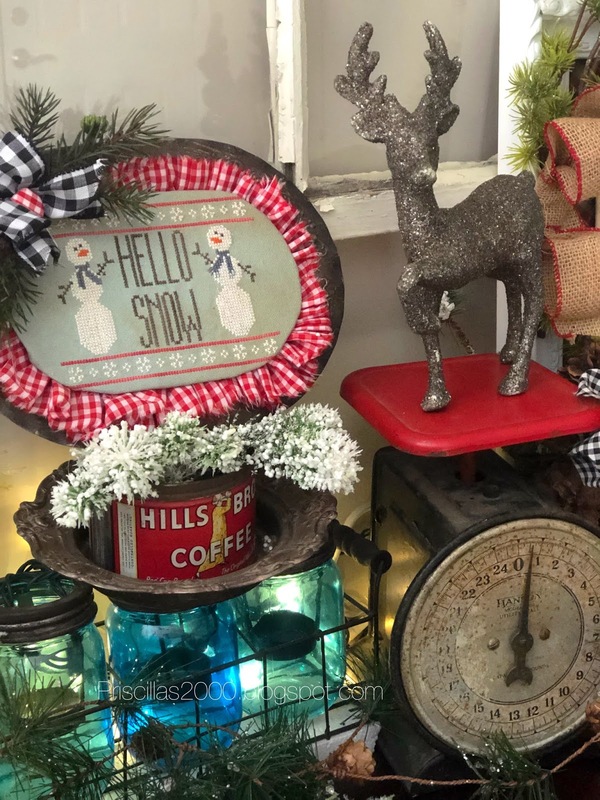 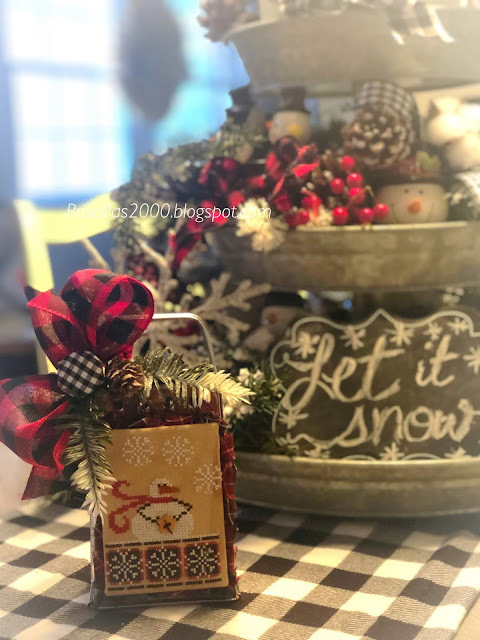 I added 2 winter greenery and berry picks .. a flannel plaid bow and a pinecone onto a magnet so that can be removed too ..
A little tour of the hutch decorated for Winter! 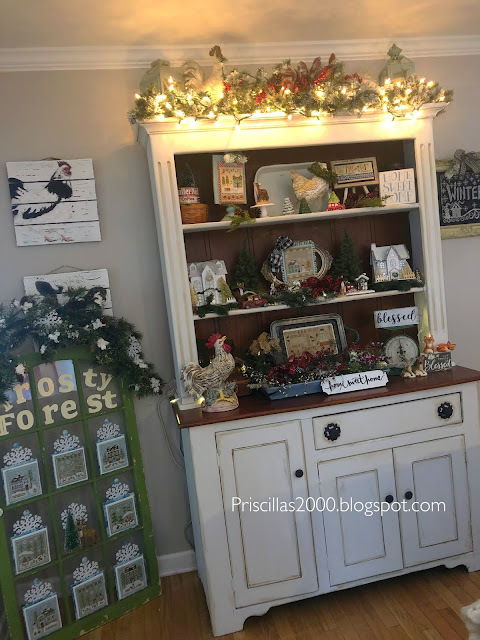 I found this hutch on Craig's List .. it was hunter green and I chalk painted it off white and distressed it .. There are 4 stitched pieces in the hutch .. 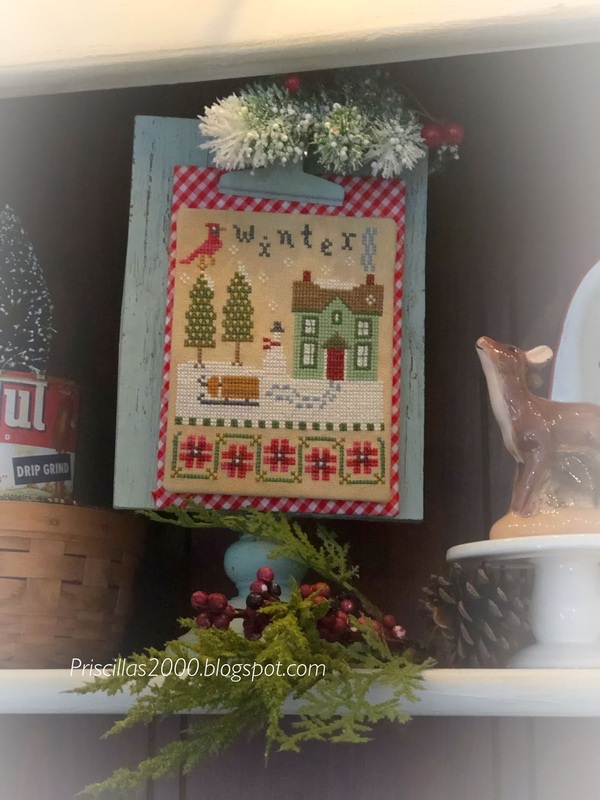 This one is Country Cottage Needleworks January cottage ..
glittery houses .. a vintage scale vintage enamel pan .. chickens .. and cute wintery salt and pepper shakers are all present .. 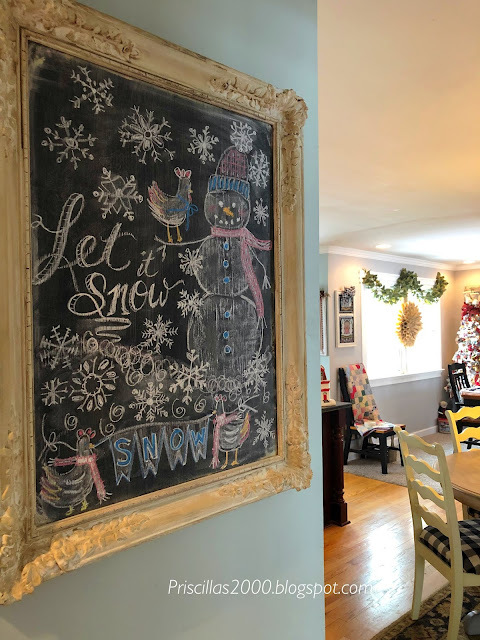 The kitchen chalkboard is all snowed in ! Snowflakes.. a cute snowman ..and chickens wearing scarves with a banner .. what could be better for Winter! 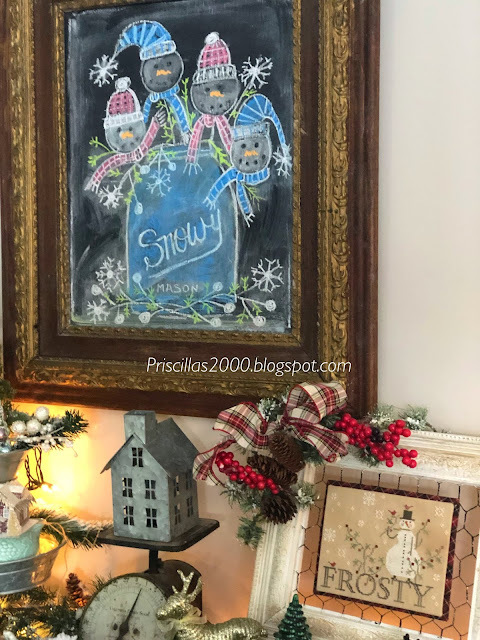 It is a vintage frame I had a board cut to fit and painted it with chalkboard paint .. 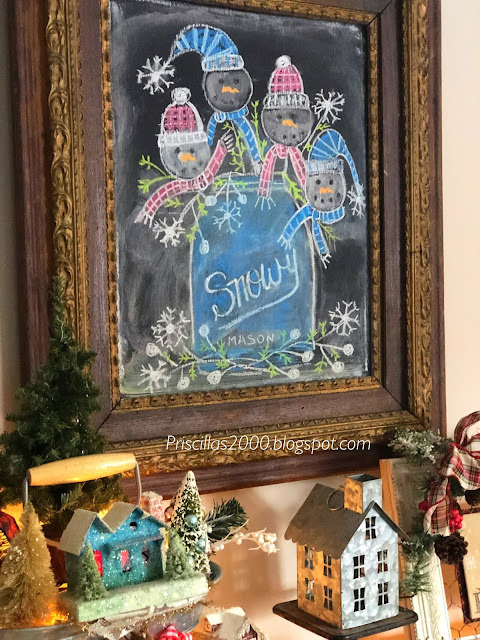 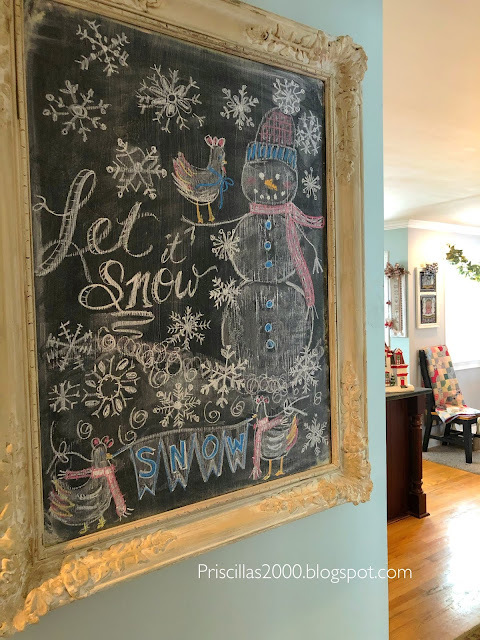 The mason jar chalkboard is now filled up with snowmen! 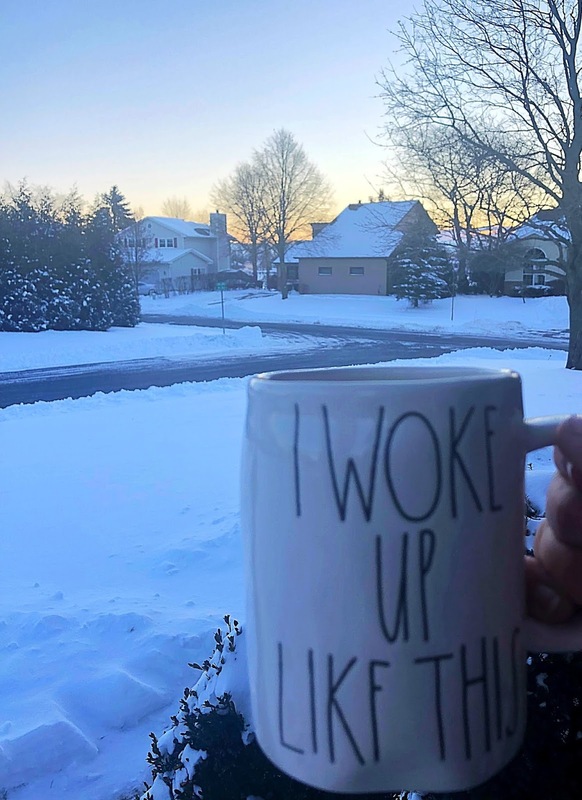 We actually got a couple inches of snow last night .. we haven't had very much at all this winter! 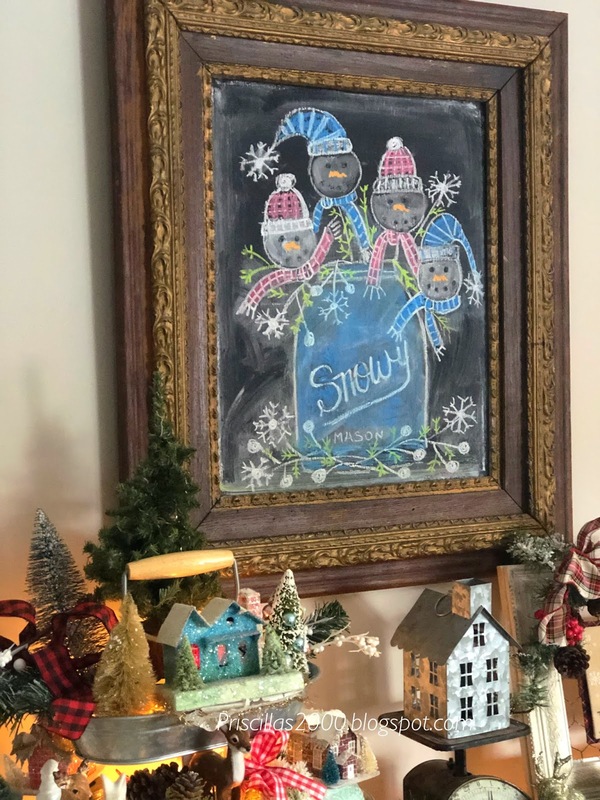 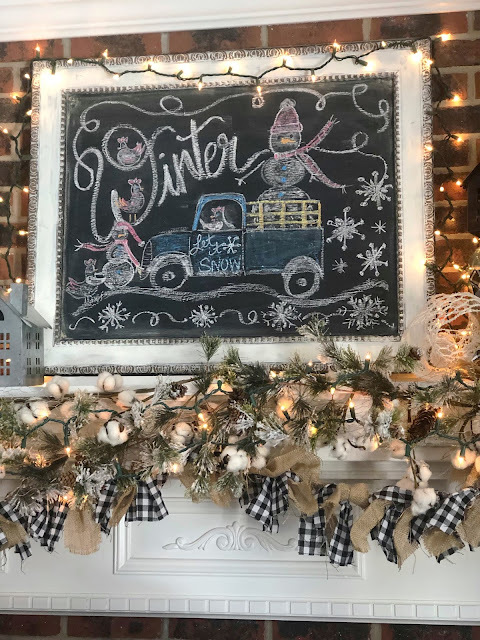 This chalkboard is in my family room and hangs over the vintage buffet.. 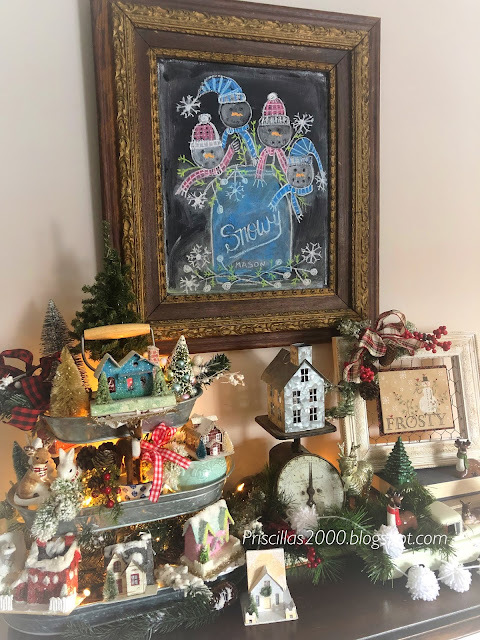 It's a very vintage frame that I had a board cut to fit..and then painted with chalkboard paint .. my oval galvanized tiered tray sits on the buffet full of vintage and newer putz type houses.. 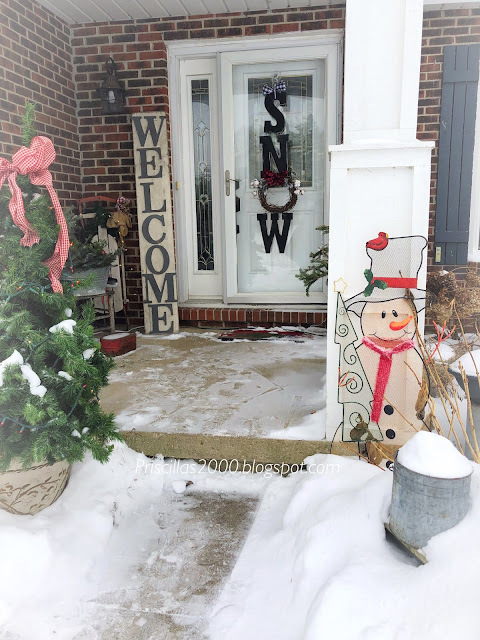 I leave my winter decor up until sometime in February when I transition to spring! Jolly Happy Soul from With Thy needle and thread also sits on the buffet ..